how's the weather where you guys are? here it's still crazy... going up and down in temperature all the time. it's made my allergies kick off majorly. luckily, i'm the only one in the family that it's happened to so far, so hopefully Mr. Pawlish and Mama Pawlish will be spared! 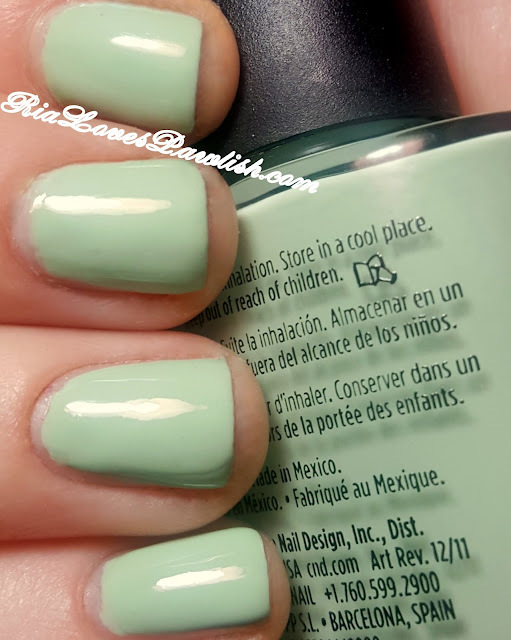 today we are checking out CND Vinylux in Mint Convertible! as you might guess, it's a mint green creme with a slightly warm undertone out in the sun. the bottle i got on clearance was quite clumpy and difficult to work with... i suspect the cap wasn't put back on securely at some point, so i'm not going to make judgements about it. i did use two coats for full opacity. and definitely finish off with CND Vinylux Weekly Top Coat! two coats Mint Covertible, one coat Weekly Top Coat. you can check out CND products on their WEBSITE. i will probably be buying their Vinylux line from Ulta and Ulta.com, where they retail for $10.50. Nail Polish Clearance at Ulta!